The rise of robots and its utilization can not be over emphasized. Most companies are beginning to go into it which really is a good thing following the fact that the sole aim of building it is to make life a lot more easier and stress-free but the truth is, in every innovation be it science, arts, or whatever that has to do with working around humans, there are always some kind of bugs flaring up which if not corrected and go against the sole aim of the innovation or rather what the original manufacturer has in mind. Which in this case is between a robot and a 16 months old boy. 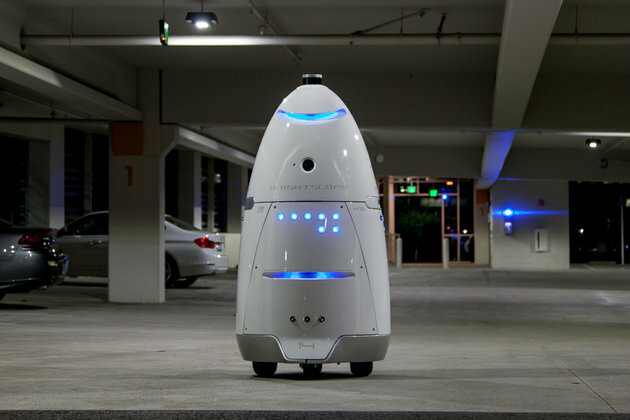 As reported by ABC 7, a 16 month old baby boy was hit by a 5 foot tall,300 pounds security robot at a California mall. The robots whose main use was to protect human following some strange sounds, environmental changes through the use of lasers,thermal imaging sensors,360 videos,air quality sensors, microphone and some other cool technologies went bad as its sole aim was modified. What should have prompted the robot to get so pissed up to the extent of running over a small child (even though i don’t think it recognized that it was), no one knows but what the Mother of the 16 months boy had to say was,“The robot hit my son’s head and he fell down — facing down on the floor — and the robot did not stop and it kept moving forward,” He suffered a swollen foot and several scrapes and it could have been worse if the father had not pulled the boy away. Though everyone (Me not exempted) must be pouring all the blames to the initiators of these robots but bear it in mind that this can be as a result of some technical flaws (Why obviously would be making me to blame them) which should obviously be figured out, since they are working with robots which they “claim” would be saving lives. I believe there should be a <1% flaw even though that is much considering they are automated beings.